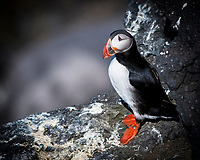 The Atlantic puffin, or the common puffin, Fratercula arctica, is a species of seabird in the Family: Alcidae, which represents auks. 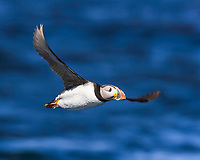 The only puffin native to the Atlantic Ocean, breeds in many countries and islands facing North Atlantic Ocean. They catch and feed on various small fish by diving underwater, using their wings for propulsion.